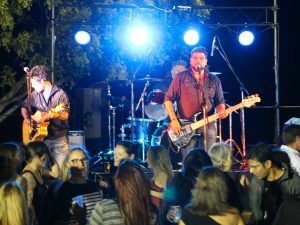 Built in 2012 and released in three stages between 2012 and 2015, Freshwater Apartments is the newest Kununurra hotel and the only 4.5 star Kununurra accommodation. We are ranked the number 1 Kununurra hotel on Trip Advisor, Agoda, Booking.com, and Expedia, based on customer reviews. In 2016 and 2017 we were awarded the seventh best hotel in Australia in the Trip Advisor Travellers Choice Awards. We have won Gold and Bronze in the Deluxe Accommodation category at the 2014 and 2015 WA Tourism Awards. We were also finalists at the 2015 Australian Tourism Awards. Studio Apartments: Comfortable hotel-style room, complete with kitchenette. One Bedroom Apartments: Separate bedroom to living area, 2 televisions, luxurious private outdoor rain shower, fully self-contained kitchen, balcony or patio. Two Bedroom Apartments: 2 bedroom 1 bathroom apartment or 2 bedroom 2 bathroom apartment, huge living area, split or double bedding arrangements, large fully self-contained kitchen, balcony or patio. Three Bedroom Apartments: Huge 146m2 3 bedroom 2 bathroom apartment including private outdoor rain shower.Double or split bed arrangement, full kitchen, large lounge area, balcony or patio. • Self Catering is far more convenient than having to eat out all the time. Our huge kitchens provide absolutely everything you could require to prepare delicious and healthy meals while away from home. • Our outdoor BBQ area is another way to take advantage of the self-catering accommodation facilities and enjoy the beautiful Kimberley weather. • Complimentary onsite guest laundry. • We offer complimentary airport transfers and 10am town transfers each day. • Our heart breakfast baskets can be pre-booked and will be in your apartment on arrival. Breakfast baskets include bread, cereal, yoghurt, eggs, fruit, juice, milk, the local paper and condiments. • Stay connected on your holiday with our complimentary free wifi. 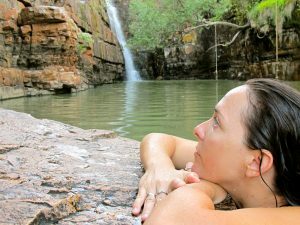 • We’re more than happy to provide information and bookings on tours and attractions for your Kununurra holiday. Most tour operators will pick up and drop off from Freshwater Apartments. Freshwater Apartments is one of the most ideally located hotels in Kununurra. 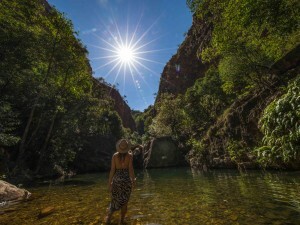 Situated just opposite the picturesque Lily Creek Lagoon, and only 1km from the Kununurra CBD. This Kununurra hotel has the best of both worlds with its close proximity to town yet secure quiet location. All Freshwater Apartments guests receive a 10% discount at the beautiful waterfront Pumphouse Bar and Restaurant. We offer specials and packages throughout the year to help save you money! Our convenient self catering facilities help you avoid the added cost of dining out every meal. 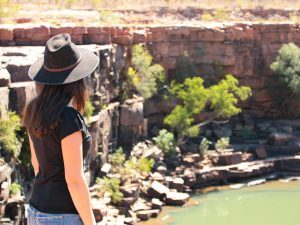 We’re a local team with a combined wealth of knowledge on the Kimberley and Kununurra. Freshwater Apartments developer Michael McConachy’s vision was to create a comfortable and stylish sanctuary that honours the impressive Kimberley landscape and stands out amongst other Kununurra Hotels and. Freshwater’s signature pool features a Kimberley waterfall, each apartment showcases local photography and artwork and is designed to encourage the Kimberley tradition of inside and out living. Our commitment to environmental and community sustainability is demonstrated through our use of water and electricity saving appliances, drip line reticulation, community sponsorship programs, and tourism industry support.